The hopping dead of the 80s Hong Kong Mr. Vampire movie series is brought back to live in this lively but less comedy orientated tribute by Juno Mak, in his debut as a director. The story is pretty simple; a middle- aged man moves into an apartment in an old, rundown block of building. As it turns out, he intends to end his life there because of his career and family problems. However, he fails his suicide attempt and becomes possessed by some evil spirits that still haunt his apartment. From here, we are introduced to the rest of the occupants as he slowly gets to know them and learn about their everyday life, while strange things start to happen. Soon enough, besides the living, we encounter death, the undead, ghosts and the granddaddy of them all, the hopping vampire (Jiangshi) fully dressed in his finest traditional costume of course. Welcome to the rundown building that’s the breeding ground for creepy, gruesome tales and black magic. Juno Mak did a fantastic job on this tribute; he even recruited some of the veterans from the original Mr. Vampire movie series. The movie looks great and the special effects are believable, very well put together, full mark to the set designs and art direction. Actor Chin Siu-ho, who plays Chin, the troubled suicidal man, is very good at portraying a tired looking, down on his luck and sad human being. Another actor from the Vampire series, Anthony Chan plays Yau. He is actually a retired Vampire hunter now running a small eating place in the building. Interestingly, he now specializes in cooking glutinous rice, which in fact was an ingredient used to hunt those hopping vampires in the old days. Consequently, the two men bond and face the Vampire that will soon haunt their building. Kara Hui, another veteran, plays Yang Feng, who’s a traumatized character and mother to an albino young son. She is forever looking for her son as he likes to explore and getting into trouble. Accordingly, her search leads her face to face with the dreaded Vampire which ends up in a fierce fight. There is also an old lovely couple, Uncle Tung, played by Richard Ng and Auntie Meiyi, played by Nina Paw Hee-Ching. One day, Uncle Tung falls down the stairs and dies, but Auntie Meiyi is too heartbroken to let him go. This leads her to seek help from a local black magic master, Gau (Chung Fat) as she is determined to preserve and bring him back to live. The scene in which she dresses her husband in the traditional costume is both very touching and sad. Nina brings so much human emotion in her role and it is a delight to watch her. Richard Ng, who usually plays comedic roles, is more serious here as Uncle Tung but is equally good. He is eventually resurrected as a disfigured Vampire or Jiangshi by Gau in which he proceeds to haunt the building block with his killing spree. “Rigor Mortis” is a well-balanced, modern update of both 80s Hong Kong and Japanese horror genre filled with interesting characters that you care about. Juno Mak didn’t use lots of blood or gore to tell his story or to shock the viewers; in fact, the slow pacing actually helps to bring out the movie’s spooky and gloomy atmosphere. There are lots of references to traditional Chinese mythology with a touch of Japanese horror, courtesy of a pair of long haired ghostly twins. 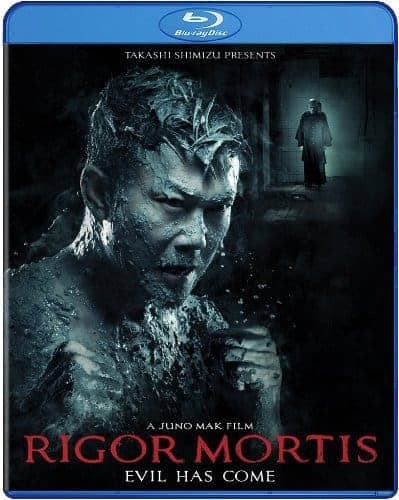 Overall, I highly recommend “Rigor Mortis” to anyone who likes Asian horror because of its stunning beauty, moody atmosphere and a great study of characters.